Busy loving up on my Brooklyn-girl who is going to be six in a few days!! Her Grandma Loretta bought her the American Girl doll. Talk about darling! You can see a glimpse of the quilt I made her on her bed. Of course, I had to stop in my favorite quilt shop while we were in town visiting Brooklyn. 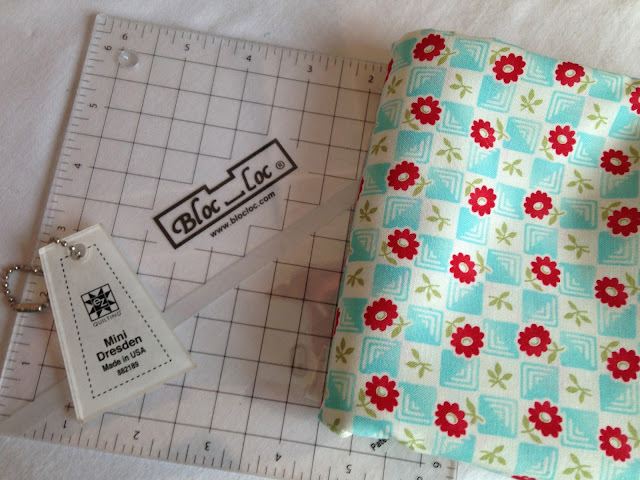 I found some Bliss yardage, a new dresden ruler...I love tiny dresdens!..and a 6 1/2 inch Bloc Loc ruler that I have been wanting to try. I have heard nothing but good things about them. On the quilting front, I am slowly, but surely getting Flower Girl quilted. Last week, I went on a girls day out with some dear friends from church. We visited our local antique shops. I couldn't resist the baby dress patterns. 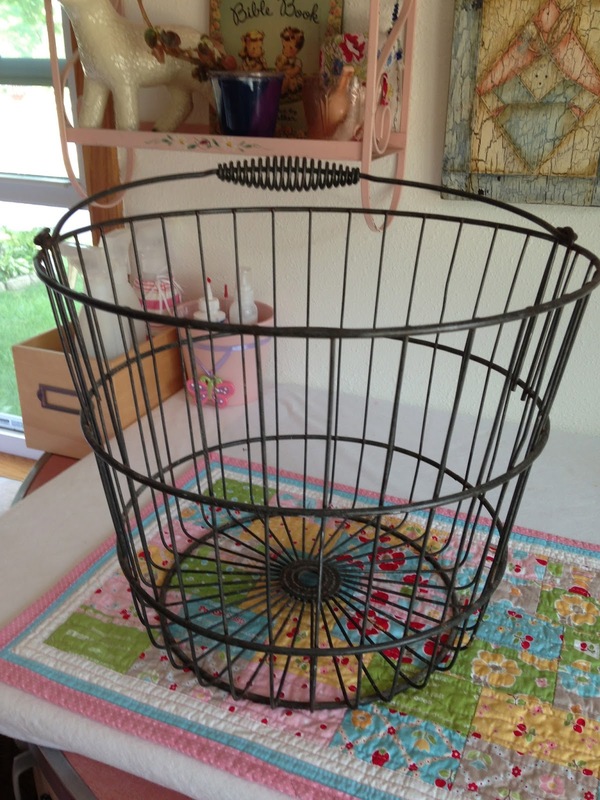 And I have been wanting an egg basket for a long time. These things are pricy!! This one was on sale, so I grabbed it up. I am not exactly sure what I am going to do with it, but I am certain I will think of something. As I have been checking in with the blogs I follow, I see everyone is so very busy. It has me wondering if it has it always been this way or is it more so in the last decade or two? I don't remember my parents being so busy, or maybe I was too young and selfish to notice. What do you think? Hi Amy. So nice to see your post. Your Brooklyn is a sweetheart and I love her American Girl doll. So precious. 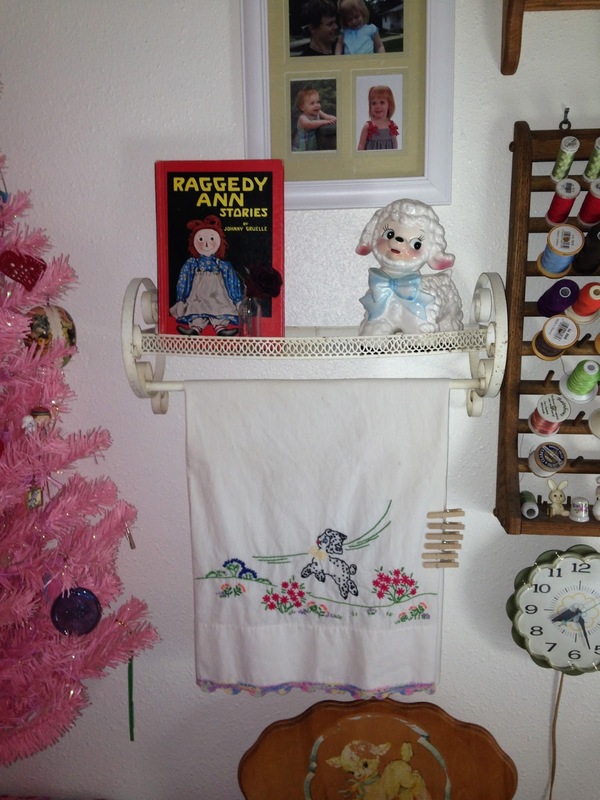 I love your egg basket and I have a few of them. One is actually for collecting eggs and the other two are for fruit that doesn't go in the fridge. I keep them on my kitchen counter top. I think folks are way too busy these days and it's frustrating. My husband and I have been talking about it quite a lot as he and his brother prepare for retiring their business. People need to slow down because you can't get your days back. I don't want to look back and regret being so busy with just...stuff. Life is short and none of us no the number of our days, so it's best to enjoy each moment. I hope you are doing well and I am praying for you always. Brooklyn's adorable and I'm so glad you got to spend time with her! 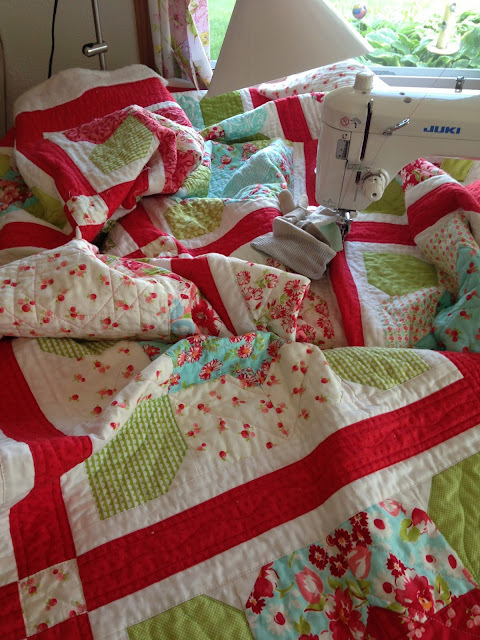 Your flower girl quilt looks beautiful! Brooklyn and her doll are the cutest twins!! Love that picture! You really got some cute patterns there! I love the graphics. Those style of dresses were the best ever. Oh, my goodness, and jackets, too! I love the egg basket. So many uses for that. Now you need to learn how to make doll clothes (with matching doll quilts). Maybe even matching outfits for Brooklyn and her doll. I LOVE my Bloclock. They are great! I think we have a much easier time getting involved in many things that our parents and grandparents never had a chance to do. So many of their activities were 'work' while we get to enjoy or activities more. As always your quilt is gorgeous as well as your Brooklyn! And yes I agree, we also have studied this at church. The devil would like nothing more than to keep us busy, busy, busy with things. Don't get me wrong most are wonderful worth while things. But....ultimately they are not in God's plan for our life at this moment. Been there done that. Your Brooklyn is such a 'doll'! I love the American Girl doll. Their glasses match! I love that!! Your quilts are beautiful, and so are you my friend. BTW, I think there was a basket much like that at the SA near you if you want another. I love all your new treasures, but not as much as I treasure you. I can't wait to see what you do with the mini dresden ruler! How fun! Brooklyn is so cute with her new doll. What a precious baby girl. Love your patterns. 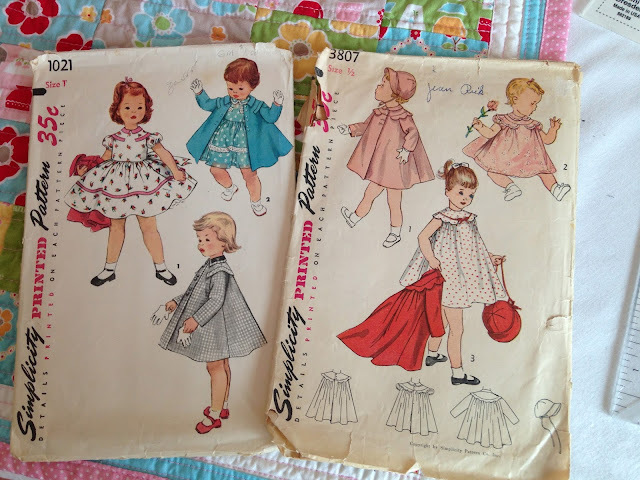 My aunt and I where talking about old patterns she used have today. The shelf that Judy gave you is just perfect. Hi Amy! I'm sure you had a grand time with Brooklyn! Love that Bliss and I'd LOVE to own one of those egg baskets! Great job on finding a sale! Yes, they're pricey! Brooklyn is such a sweetie! I am sure you guys had a great time! I love that Bliss fabric! I think things just move faster now than what they used to. My parents were busy but always made time for doing family stuff everyday, not just supper together once a week! You are gal after my own heart.....twins separated at birth?....I have some of those patterns...a few of my Moms'...we used chee ....and the egg basket too...mine is old and yellow...I have quilt magazines in mine....my daughter in law snatched my other one years ago! !...with 8 Grandgals myself all of my sweeties have had Bitty Baby and then marched on to the Older Dolls...I LOVE them...I want one!! !....Ok!, gotta get quilting on Dance With Me...signature quilt for son's 5K walk/run on 20th for his Kidney trnasplant (has 2 matches so far from live donors).....see you later!! Keep it up girlfriend!! had to come right back and share this....just saw on a womans' sweatshirt on thequiltshow.com.....concerning being "busy"...I am so thankful God gives us the health to stay busy....anyways....the quote..... "the YEARS have been good to me....it is the "WEEKENDS" that have done me in! ...... haha so true! God Bless!! What a cutie pie! I just love old patterns. I have a ton of them I was going to sell but need to go through and make sure they still have all the pieces.